We were at a gas station in the Georgetown area of Seattle, which is the industrial area by Boeing Field. It was around lunchtime, and I needed a snack. My husband mentioned that when he had gone in to pay for gas, he had seen “something interesting made with chicken” in the quickie mart’s hot case. Intrigued, I went to investigate. Inside the mart’s hot case were all of the usual suspects: corndogs, deep fried burritos, chicken strips. Then I saw what my husband had been talking about. 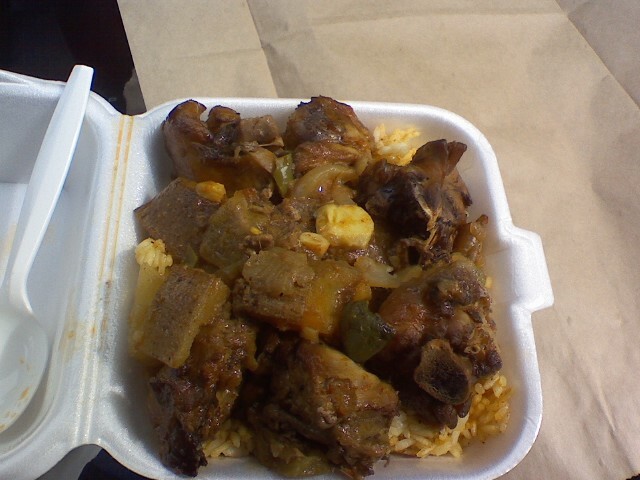 I asked the clerk what it was, and I was incredibly surprised when she said it was chicken kaldereta. Kaldereta is Filipino comfort food at its finest. It’s a tomato-based stew made with potatoes, bell peppers, carrots, olives and liver paste. I’m Filipino American and have savored many steaming bowls of rice smothered with kaldereta. I was skeptical whether the chicken dish in the hot case was actually kaldereta. 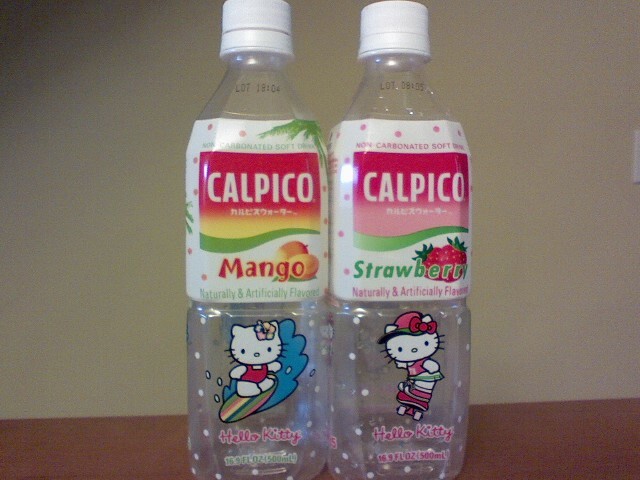 But I knew when I heard the clerk talking to another quickie mart employee in Tagalog, I knew it was authentic. I love finding good food in unexpected places. Check it out for yourself at the Georgetown Shell, 6200 Corson Ave. S., Seattle 98108. Hot lunches served from 10am-3pm. 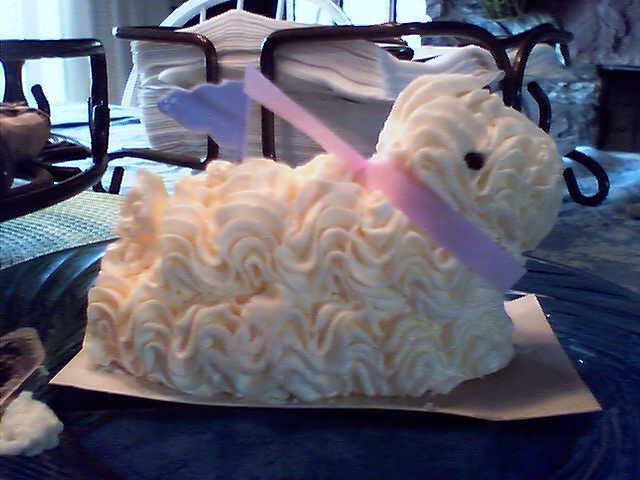 My friend Lynn sent this photo to me as part of her Easter greetings. How cute…until the butter knife gets involved. I was rummaging around in the garage and stumbled upon a box labeled “Rap Snacks.” Buried treasure! 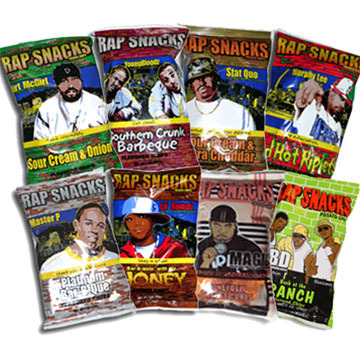 A few years ago, I started collecting Rap Snacks purely because they make me laugh. How could I resist something named “Bar-b-quin’ With My Honey Flavored Chips?” Each Rap Snacks bag has an illustration of a rapper along with a positive message, which leads to an incongrous (and in my mind, hilarious) effect. For example, Extra Hot Red Hot Riplets features Murphy Lee and the line “Pimp education.” What does that even mean?! While I appreciate the sentiment behind Rap Snacks, I’m skeptical that inner city youth (the target audience for Rap Snacks) are going to take these sentiments to heart. Plus why do Rap Snacks have to be so unhealthy? One bag of chips has around 25-30 grams of fat and as much as 1,760 mg of sodium (the daily recommended amount is 1,500). I realize that when it comes to chips, health isn’t the main priority so it all comes down to taste. I haven’t liked any of the Rap Snacks I’ve sampled, but Taquitos.net gives 11 flavors good reviews. Head down to your local “urban” grocery store/minimart/bodega and try some for yourself. The store undoubetably needs, and will appreciate, your business. Last week PopWatch (inspired by New York Times food critic Frank Bruni) ran an interesting post about the music played in high-end restaurants. I believe restaurant music should be like good food–an unexpected delight. A few years ago, my husband and I were dining at Canlis, arguably Seattle’s swankiest and most old-school restaurant. As one might expect, Canlis had a live pianist in a tux tickling the ivories. He played mostly classical and jazz standards, but then I heard a familiar tune. It was Gnarls Barkley’s “Crazy.” Awesome! Here’s a theremin cover of the tune. Dave Chappelle does a hilarious commentary on food and race, including the difference between grape juice and grape “drink.” WARNING: contains NSFW language, including the n-word. I went to bed late last night, and I had one of those moments of clarity that only come when I’m semiconscious at 1am. I realized that my lack of enthusiasm for the frozen yogurt trend might be connected to a significant event in my past. I’ve only been fired once in my life, and it happened when I worked at a frozen yogurt shop. The place was called Yogido’s, and it was in the food court of my local mall. I worked there when I was a junior in high school. Yogido’s had a wacky premise. It sold frozen yogurt and…donuts. Hence the “clever” name. It also had a salad bar. I know–huh? We didn’t even make the donuts. The owners would buy a few dozen from the grocery store and bring them in to resell. The owners were a Korean couple, Mr. and Mrs. Ryu. When I interviewed for the job, the only questions I remember them asking me were “Are you Christian?” and “When will you go to church?” (They needed someone to work the Sunday morning shift.) I said I was Catholic and could attend mass on Saturdays (which I actually did do). One night I was working with Mrs. Ryu. She watched me scoop ice for a customer’s drink and said something to me. I knew she was giving me some kind of direction, but I had no idea what it was. Frustrated, I muttered something like, “I know what I’m doing” in Mrs. Ryu’s general direction. She looked at me sharply, and I understood her then. It was my last night as one of her employees. Sure enough, when I came to check the work schedule the next week, my name wasn’t on it. That was how the Ryus let you know you were fired. Now that I’m older, I can see myself through Mrs. Ryu’s eyes. She probably thought I was a disrespectful girl who couldn’t listen. The thing is, nothing could be further from the truth. I’m a rule follower, a team player. I respect my elders and authority. I’ve always prided myself on my listening skills and my empathy for others. But maybe this sense of my self only holds true if the situation is easy–if the person is likeable and seems to like me and seems to be like me. Who thought frozen yogurt could cause so much introspection?! The Pinkberry-inspired phenomenon is hitting the greater Seattle area full force. A host of shops are vying for fro-yo supremacy and more are opening soon. There’s Crazycherry, Cefiore, Yoberry. TCBY is even being ressurrected. 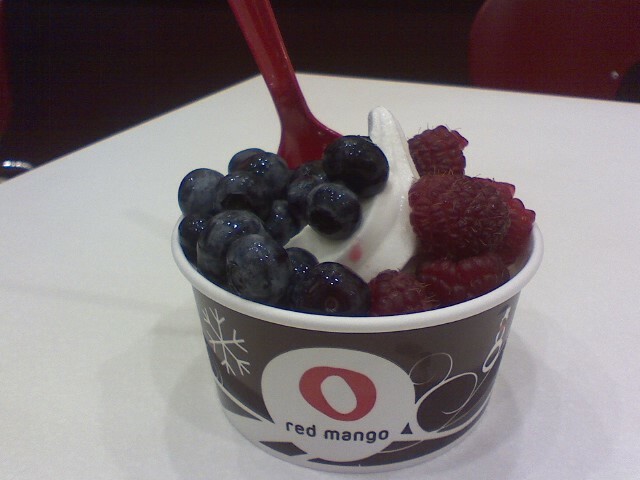 Red Mango, the granddaddy of the resurgent fro-yo craze, recently opened a store in Bellevue Square and Alderwood Mall and has plans for another location in Southcenter Mall. I’m a little surprised Seattle and environs didn’t pick up this trend sooner. It fits right into our culture. The new fro-yo is loaded with probiotics so you can feel healthy even while coating your yogurt with Fruity Pebbles. The Asian-influenced green tea flavor is another ethnic food trend we can embrace. And you can eat fro-yo while walking your dog. I have sampled the wares at Crazycherry and Red Mango and enjoyed the frozen treats, but what’s the big deal? It’s, well, yogurt. What other 80’s food fads are poised for a comeback? Blue raspberry flavored popcorn, I eagerly await your return. I recently met Jaclyn and Levi, the owners of @harshfarm, a micro farm located about an hour west of Seattle on the Kitsap Peninsula. I love Jaclyn and Levi’s goal to provide the community with nutrient dense produce to improve health, and quality of life. Their micogreens are gorgeous to look at and amazing to eat! My mom was hospitalized for a week for heart failure and pneumonia and is now in a short-term rehabilitation facility to get stronger. We took her for a stroll so she could see beyond her room, look out a window, and feel sunshine on her face.